A comprehensive range of both lightweight and heavyweight composite hoses designed for road tanker/ forecourt fuel delivery as well as heavier duty ship to shore and on board marine transfer. Danoil 3AA Polypropylene lined composite hose with aluminium inner and outer wire. Multi-layer thermoplastic hoses (composite hoses), for suction and pressure operation. Danoil 3AG Polypropylene lined composite hose with aluminium inner wire and galvanised mild steel outer wire. Danoil 3GG Polypropylene lined composite hose with galvanised mild steel inner and outer wire. Application: Ease of use as a road tanker delivery hose. Danoil 7AG Polypropylene lined composite hose with aluminium inner wire and galvanised mild steel outer wire. Application: Rail car loading and unloading, road tanker bottom loading & in plant hose exchanges. Danoil 7GG Polypropylene lined composite hose with galvanised mild steel inner and outer wire. Application HD: Ship to shore and on board marine transfer. Danoil 9AG Polyamide lined composite hose with aluminium inner wire and galvanised mild steel outer wire. Media: Biodiesel, high aromatic solvents and MTBE. Danoil 9GG Polyamide lined composite hose with galvanised mild steel inner and outer wire. Danoil 9SG Polyamide lined composite hose with stainless steel inner wire and galvanised mild steel outer wire. Danoil 9SS Polyamide lined composite hose with stainless steel inner and outer wire. Danoil 3AA Fire~Safe VRS Polypropylene lined fire~safe VRS composite hose with aluminium inner and outer wire. Danoil 3AG Fire~Safe VRS Polypropylene lined fire~safe VRS composite hose with aluminium inner wire and galvanised mild steel outer wire. Danoil 3GG Fire~Safe VRS Polypropylene lined composite hose with galvanised mild steel inner and outer wire. Danoil 7AG Fire~Safe VRS Polypropylene lined fire~safe VRS composite hose with aluminium inner wire and galvanised mild steel outer wire. Danoil 7GG Fire~Safe VRS Polypropylene lined fire~safe VRS composite hose with galvanised mild steel inner and outer wire. Danoil 9AG Fire~Safe VRS Polyamide lined fire~safe VRS composite hose with aluminium inner wire and galvanised mild steel outer wire. Danoil 9GG Fire~Safe VRS Polyamide lined fire~safe VRS composite hose with galvanised mild steel inner and outer wire. Danoil 9SG Fire~Safe VRS Polyamide lined fire~safe VRS composite hose with stainless steel inner wire and galvanised mild steel outer wire. Danoil 9SS Fire~Safe VRS Polyamide lined fire~safe VRS composite hose with stainless steel inner and outer wire. The Danchem range of hoses makes use of highly durable, robust materials designed to provide the ultimate security for potentially hazardous materials. Description The Danchem range of hoses makes use of highly durable, robust materials designed to provide the ultimate security for potentially hazardous materials. Danchem PG Polypropylene lined composite hose with polypropylene coated steel inner wire and galvanised mild steel outer wire. Application: Plant Transfers, road tankers and rail tanker unloading. Application HD: Ship to shore and marine applications. Media: Wide chemical range, please check our chemical resistance chart or contact the Dantec sales team. Danchem PS Polypropylene lined composite hose with polypropylene coated steel inner wire and stainless steel outer wire. Danchem SG Polypropylene lined composite hose with stainless steel inner wire and galvanised mild steel outer wire. Danchem SS Pivot (Roof Drain Hose) Hose has a chemical resistant outer cover for when the hose is submerged in product, with added flexibility. Application: Roof drain systems and when the hose is submerged in chemicals. Media: Water or general chemicals. Danchem PG Fire~Safe VRS Polypropylene lined fire~safe VRS composite hose with polypropylene coated steel inner wire and galvanised mild steel outer wire. Danchem PS Fire~Safe VRS Polypropylene lined fire~safe VRS composite hose with polypropylene coated steel inner wire and stainless steel outer wire. 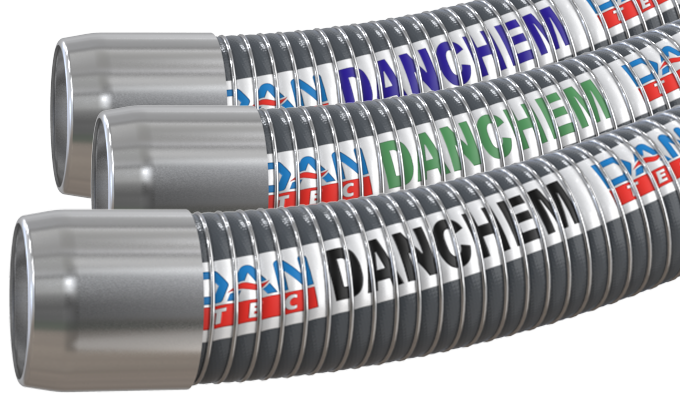 Danchem SG Fire~Safe VRS Polypropylene lined fire~safe VRS composite hose with stainless steel inner wire and galvanised mild steel outer wire. The Premium Danflon range of hoses is designed to handle the suction & discharge of the most aggressive and corrosive of chemicals. Danflon GG ECTFE lined composite hose with galvanised mild steel inner and outer wire. Media: Aggressive chemicals and acids. Danflon GGA ECTFE lined high temperature composite hose with galvanised mild steel inner and outer wire. Application: High temperature chemical transfer (up to 160° C). Application HD: High temperature ship to shore and marine applications. Danflon SG ECTFE lined composite hose with stainless steel inner wire and galvanised mild steel outer wire. Danflon SGA ECTFE lined high temperature composite hose with stainless steel inner wire and galvanised mild steel outer wire. Danflon SS ECTFE lined composite hose with stainless steel inner and outer wire. Danflon SSA ECTFE lined high temperature composite hose with stainless steel inner and outer wire. Danflon PTGG PTFE lined composite hose with galvanised mild steel inner and outer wire. Danflon PTGGA PTFE lined high temperature composite hose with galvanised mild steel inner and outer wire. Danflon PTSG PTFE lined composite hose with stainless steel inner wire and galvanised mild steel outer wire. Danflon PTSGA PTFE lined high temperature composite hose with stainless steel inner wire and galvanised mild steel outer wire. Danflon PTSS PTFE lined composite hose with stainless steel inner and outer wire. Danflon PTSSA PTFE lined high temperature composite hose with stainless steel inner and outer wire. Danflon GG Fire~Safe VRS ECTFE lined fire~safe VRS composite hose with galvanised mild steel inner and outer wire. Danflon PTGG Fire~Safe VRS PTFE lined fire~safe VRS composite hose with galvanised mild steel inner and outer wire. Danflon GGA Fire~Safe VRS ECTFE lined high temperature fire~safe VRS composite hose with galvanised mild steel inner and outer wire. Danflon PTGGA Fire~Safe VRS PTFE lined high temperature fire~safe VRS composite hose with galvanised mild steel inner and outer wire. Danflon SG Fire~Safe VRS ECTFE lined fire~safe VRS composite hose with stainless steel inner wire and galvanised mild steel outer wire. Danflon PTSG Fire~Safe VRS PTFE lined fire~safe VRS composite hose with stainless steel inner wire and galvanised mild steel outer wire. Danflon SGA Fire~Safe VRS ECTFE lined high temperature fire~safe VRS composite hose with stainless steel inner wire and galvanised mild steel outer wire. Danflon PTSGA Fire~Safe VRS PTFE lined high temperature fire~safe VRS composite hose with stainless steel inner wire and galvanised mild steel outer wire. 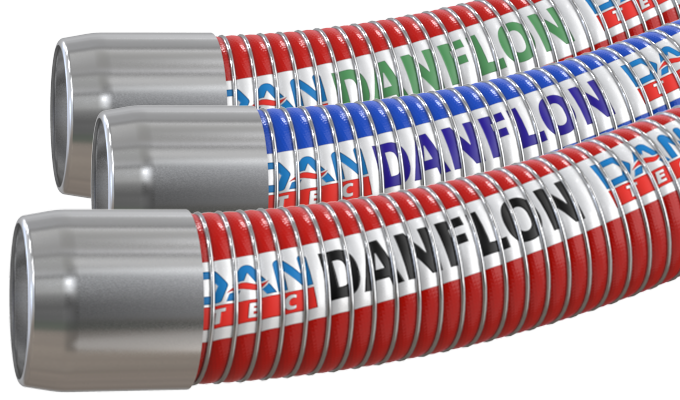 Danflon SS Fire~Safe VRS ECTFE lined fire~safe VRS composite hose with stainless steel inner and outer wire. Danflon PTSS Fire~Safe VRS PTFE lined fire~safe VRS composite hose with stainless steel inner and outer wire. Danflon SSA Fire~Safe VRS ECTFE lined high temperature fire~safe VRS composite hose with stainless steel inner and outer wire. Danflon PTSSA Fire~Safe VRS PTFE lined high temperature fire~safe VRS composite hose with stainless steel inner and outer wire. Our range of liquefied gas hoses have been specially developed to meet the most stringent international operating standards and are ideally suited to low temperature resistance. Description Our range of liquefied gas hoses have been specially developed to meet the most stringent international operating standards and are ideally suited to low temperature resistance. Danchem PA SS 100 Polyamide lined liquid gas composite hose with stainless steel inner and outer wire. Application HD: For ship to shore & ship to ship transfer, road tanker, rail tanker and in plant applications. Media: For transfer of liquid gases. Hose manufactured to order depending on application. Certified for LPG transfer to -50° C . Also available for Liquid Ethylene transfer to -104° C.
Danchem PA SS 100 Ammonia Polyamide lined liquid ammonia composite hose with stainless steel inner and outer wire. Media: For transfer of liquid gases. Hose made to a special construction for the transfer of liquid ammonia. Media: For transfer of liquid gases. Hose made to a special construction for the transfer of liquid CO². Dantec range of vapour hoses feature Sure-lec guaranteed electrical continuity and are suitable for even the most aggressive of chemical vapour return applications. Description Dantec range of vapour hoses feature Sure-lec guaranteed electrical continuity and are suitable for even the most aggressive of chemical vapour return applications. Danoil VRGG Polypropylene lined composite vapour return hose with galvanised mild steel inner and outer wire. Application: Marine, road and rail tanker operations. Media: Vapour return of hydrocarbon products. Danchem VRPG Polypropylene lined composite vapour return hose with polypropylene inner wire and galvanised mild steel outer wire. Multi-layer thermoplastic hoses (composite hoses), for vapour balance systems. Danchem VRSG Polypropylene lined composite vapour return hose with stainless steel inner wire and galvanised mild steel outer wire. Danchem VRSS Polypropylene lined composite vapour return hose with stainless steel inner and outer wire. Danflon VRSG ECTFE lined composite vapour return hose with stainless steel inner wire and galvanised mild steel outer wire. Media: Vapour return of aggressive chemical products. Danflon VRSS ECTFE lined composite vapour return hose with stainless steel inner and outer wire. Danoil VRGG Fire~Safe VRS Polypropylene lined fire~safe VRS composite vapour return hose with galvanised mild steel inner and outer wire. Danchem VRPG Fire~Safe VRS Polypropylene lined fire~safe VRS composite vapour return hose with polypropylene inner wire and galvanised mild steel outer wire. Danchem VRSG Fire~Safe VRS Polypropylene lined fire~safe VRS composite vapour return hose with stainless steel inner wire and galvanised mild steel outer wire. Danchem VRSS Fire~Safe VRS Polypropylene lined fire~safe VRS composite vapour return hose with stainless steel inner and outer wire. Danflon VRSG Fire~Safe VRS ECTFE lined composite fire~safe VRS vapour return hose with stainless steel inner wire and galvanised mild steel outer wire. 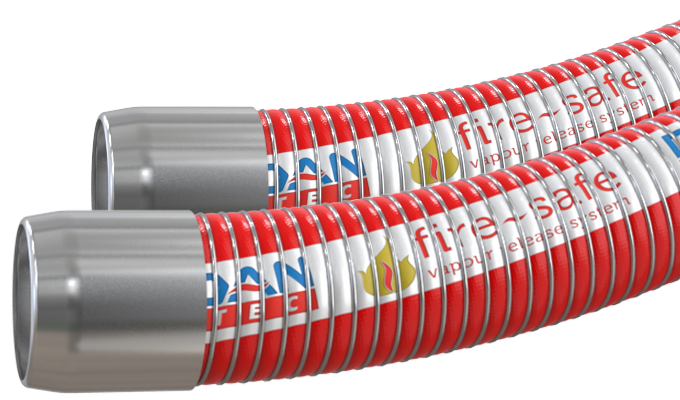 Danflon VRSS Fire~Safe VRS ECTFE lined fire~safe VRS composite vapour return hose with stainless steel inner and outer wire. 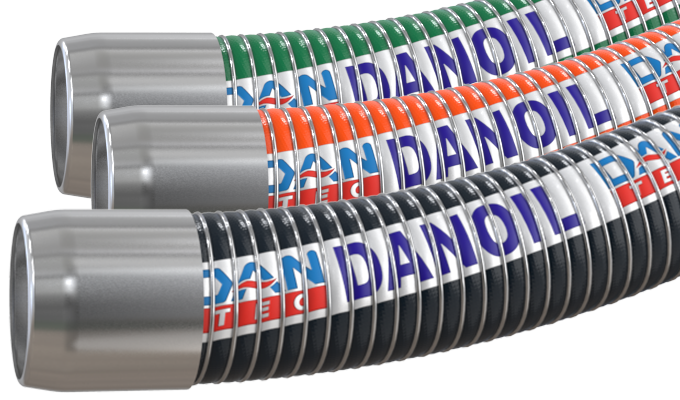 Dantec Fire~safe VRS composite hose, provides maximum protection for your assets when transferring fuel & other hazardous liquids, vapour is released gradually to prevent sudden catastrophic failure. * detailed Information for used media and operation conditions required. The recommended hose is for chemical resistance guidance only. Other factors to be considered for composite hose selection are operating temperature, working pressures, application, storage, humidity, mix of chemicals, viscosity and cleaning methods. Whilst the information provided is intended to assist in the selection of the best hose configuration, it is a guide only and does not guarantee suitability, it is the responsibility of the user to ensure compatibility. Please contact Dantec technical team for further assistance. Polypropylene lined composite hose with aluminium inner and outer wire. Short Description Polypropylene lined composite hose with aluminium inner and outer wire. 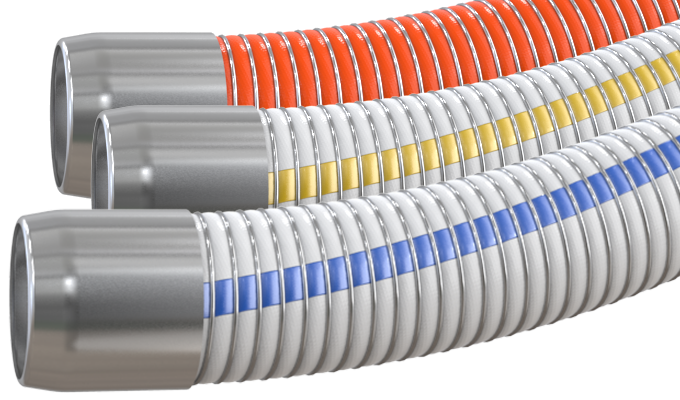 Comment Composite hose manufactured with an aluminium inner & outer wire providing an extra light weight product. Cover Orange PVC coated Polyester fabric. Polypropylene lined composite hose with aluminium inner wire and galvanised mild steel outer wire. Short Description Polypropylene lined composite hose with aluminium inner wire and galvanised mild steel outer wire. Comment Composite hose manufactured with an aluminium inner wire providing an extra light weight product. Polypropylene lined composite hose with galvanised mild steel inner and outer wire. Short Description Polypropylene lined composite hose with galvanised mild steel inner and outer wire. Application Ease of use as a road tanker delivery hose. Comment A robust light weight composite hose. Cover Green PVC coated Polyester fabric. Comment A tough, high strength composite transfer hose. Manufactured with an aluminium inner wire for applications where weight is an issue. Cover Black PVC coated Polyester fabric. Application Heavy Duty: Ship to shore and on board marine transfer. Comment A tough, high strength composite transfer hose. Polyamide lined composite hose with aluminium inner wire and galvanised mild steel outer wire. Short Description Polyamide lined composite hose with aluminium inner wire and galvanised mild steel outer wire. Cover Blue PVC coated Polyester fabric. Polyamide lined composite hose with galvanised mild steel inner and outer wire. Short Description Polyamide lined composite hose with galvanised mild steel inner and outer wire. Polyamide lined composite hose with stainless steel inner wire and galvanised mild steel outer wire. Short Description Polyamide lined composite hose with stainless steel inner wire and galvanised mild steel outer wire. Polyamide lined composite hose with stainless steel inner and outer wire. Short Description Polyamide lined composite hose with stainless steel inner and outer wire. Polypropylene lined composite hose with polypropylene coated steel inner wire and galvanised mild steel outer wire. Application Heavy Duty: Ship to shore and marine applications. Short Description Polypropylene lined composite hose with polypropylene coated steel inner wire and galvanised mild steel outer wire. Application Plant Transfers, road tankers and rail tanker unloading. Application Heavy Duty Ship to shore and marine applications. Media Wide chemical range, please check our chemical resistance chart or contact the Dantec sales team. Comment High strength durable composite hose making use of the wide chemical resistance range of polypropylene to produce a hose suitable for the majority of chemical products at an economical price. Cover Grey PVC coated Polyester fabric. Polypropylene lined composite hose with polypropylene coated steel inner wire and stainless steel outer wire. Media: For wide chemical resistance. Short Description Polypropylene lined composite hose with polypropylene coated steel inner wire and stainless steel outer wire. Media For wide chemical resistance. Polypropylene lined composite hose with stainless steel inner wire and galvanised mild steel outer wire. Short Description Polypropylene lined composite hose with stainless steel inner wire and galvanised mild steel outer wire. Hose has a chemical resistant outer cover for when the hose is submerged in product, with added flexibility. Short Description Hose has a chemical resistant outer cover for when the hose is submerged in product, with added flexibility. Application Roof drain systems and when the hose is submerged in chemicals. Media Water or general chemicals. Comment Hose has a chemical resistant outer cover for when the hose is submerged in product, with added flexibility. ECTFE lined composite hose with galvanised mild steel inner and outer wire. Short Description ECTFE lined composite hose with galvanised mild steel inner and outer wire. Comment Premium quality composite hose lined with ECTFE for its broad chemical resistance and high mechanical strength and low permeability. ECTFE lined high temperature composite hose with galvanised mild steel inner and outer wire. Application Heavy Duty: High temperature ship to shore and marine applications. ECTFE lined composite hose with stainless steel inner wire and galvanised mild steel outer wire. Short Description ECTFE lined composite hose with stainless steel inner wire and galvanised mild steel outer wire. ECTFE lined high temperature composite hose with stainless steel inner wire and galvanised mild steel outer wire. Short Description ECTFE lined high temperature composite hose with stainless steel inner wire and galvanised mild steel outer wire. ECTFE lined composite hose with stainless steel inner and outer wire. Short Description ECTFE lined composite hose with stainless steel inner and outer wire. ECTFE lined high temperature composite hose with stainless steel inner and outer wire. Short Description ECTFE lined high temperature composite hose with stainless steel inner and outer wire. PTFE lined composite hose with galvanised mild steel inner and outer wire. Short Description PTFE lined composite hose with galvanised mild steel inner and outer wire. Comment Premium quality composite hose lined with PTFE for its excellent chemical resistance. PTFE lined high temperature composite hose with galvanised mild steel inner and outer wire. Short Description PTFE lined high temperature composite hose with galvanised mild steel inner and outer wire. Comment Premium quality composite hose suitable for high temperature use up to 160° C. Hose is lined with PTFE for its excellent chemical resistance. PTFE lined composite hose with stainless steel inner wire and galvanised mild steel outer wire. Short Description PTFE lined composite hose with stainless steel inner wire and galvanised mild steel outer wire. PTFE lined high temperature composite hose with stainless steel inner wire and galvanised mild steel outer wire. Short Description PTFE lined high temperature composite hose with stainless steel inner wire and galvanised mild steel outer wire. PTFE lined composite hose with stainless steel inner and outer wire. Short Description PTFE lined composite hose with stainless steel inner and outer wire. PTFE lined high temperature composite hose with stainless steel inner and outer wire. Short Description PTFE lined high temperature composite hose with stainless steel inner and outer wire. Polyamide lined liquid gas composite hose with stainless steel inner and outer wire. Application Heavy Duty: For ship to shore & ship to ship transfer, road tanker, rail tanker and in plant applications. Short Description Polyamide lined liquid gas composite hose with stainless steel inner and outer wire. Application Heavy Duty For ship to shore & ship to ship transfer, road tanker, rail tanker and in plant applications. Media For transfer of liquid gases. Hose manufactured to order depending on application. Certified for LPG transfer to -50° C . Also available for Liquid Ethylene transfer to -104° C.
Comment High quality liquid gas composite hose, manufactured with multiple layers of polymers with excellent resistance to low temperatures. Polyamide lined liquid ammonia composite hose with stainless steel inner and outer wire. Application: Ship to shore & ship to ship transfer, road tanker, rail tanker and in plant applications. Short Description Polyamide lined liquid ammonia composite hose with stainless steel inner and outer wire. Application Ship to shore & ship to ship transfer, road tanker, rail tanker and in plant applications. Media For transfer of liquid gases. Hose made to a special construction for the transfer of liquid ammonia. Media For transfer of liquid gases. Hose made to a special construction for the transfer of liquid CO². Comment High quality cryogenic composite hose, manufactured with multiple layers of polymers with excellent resistance to low temperatures. Polypropylene lined composite vapour return hose with galvanised mild steel inner and outer wire. Short Description Polypropylene lined composite vapour return hose with galvanised mild steel inner and outer wire. Application Marine, road and rail tanker operations. Media Vapour return of hydrocarbon products. 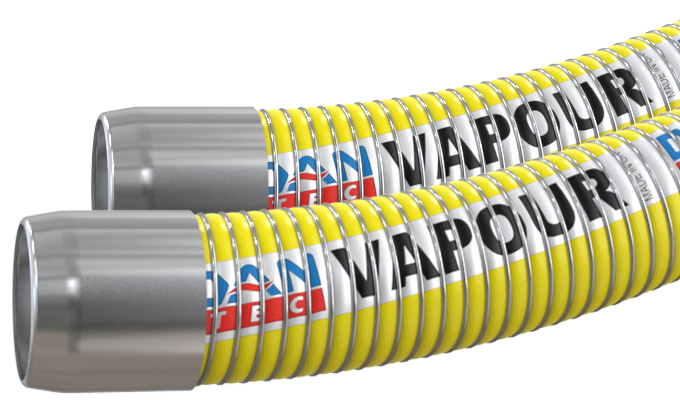 Comment Lightweight extremely flexible composite vapour recovery hose, with Dantec Sure-lec guaranteed electrical continuity. Cover Yellow PVC coated Polyester fabric. Polypropylene lined composite vapour return hose with polypropylene inner wire and galvanised mild steel outer wire. Short Description Polypropylene lined composite vapour return hose with polypropylene inner wire and galvanised mild steel outer wire. Description Multi-layer thermoplastic hoses (composite hoses), for vapour balance systems. Polypropylene lined composite vapour return hose with stainless steel inner wire and galvanised mild steel outer wire. Short Description Polypropylene lined composite vapour return hose with stainless steel inner wire and galvanised mild steel outer wire. Polypropylene lined composite vapour return hose with stainless steel inner and outer wire. Short Description Polypropylene lined composite vapour return hose with stainless steel inner and outer wire. ECTFE lined composite vapour return hose with stainless steel inner wire and galvanised mild steel outer wire. Short Description ECTFE lined composite vapour return hose with stainless steel inner wire and galvanised mild steel outer wire. Media Vapour return of aggressive chemical products. ECTFE lined composite vapour return hose with stainless steel inner and outer wire. Short Description ECTFE lined composite vapour return hose with stainless steel inner and outer wire. Polypropylene lined fire~safe VRS composite hose with aluminium inner and outer wire. Short Description Polypropylene lined fire~safe VRS composite hose with aluminium inner and outer wire. Composite hose manufactured with an aluminium inner & outer wire providing an extra light weight product. Polypropylene lined fire~safe VRS composite hose with aluminium inner wire and galvanised mild steel outer wire. Short Description Polypropylene lined fire~safe VRS composite hose with aluminium inner wire and galvanised mild steel outer wire. Composite hose manufactured with an aluminium inner wire providing an extra light weight product. A robust light weight composite hose. A tough, high strength composite transfer hose. Manufactured with an aluminium inner wire for applications where weight is an issue. Polypropylene lined fire~safe VRS composite hose with galvanised mild steel inner and outer wire. Short Description Polypropylene lined fire~safe VRS composite hose with galvanised mild steel inner and outer wire. Polyamide lined fire~safe VRS composite hose with aluminium inner wire and galvanised mild steel outer wire. Short Description Polyamide lined fire~safe VRS composite hose with aluminium inner wire and galvanised mild steel outer wire. Polyamide lined fire~safe VRS composite hose with galvanised mild steel inner and outer wire. Short Description Polyamide lined fire~safe VRS composite hose with galvanised mild steel inner and outer wire. Polyamide lined fire~safe VRS composite hose with stainless steel inner wire and galvanised mild steel outer wire. Polyamide lined fire~safe VRS composite hose with stainless steel inner and outer wire. Short Description Polyamide lined fire~safe VRS composite hose with stainless steel inner and outer wire. Polypropylene lined fire~safe VRS composite hose with polypropylene coated steel inner wire and galvanised mild steel outer wire. Short Description Polypropylene lined fire~safe VRS composite hose with polypropylene coated steel inner wire and galvanised mild steel outer wire. High strength durable composite hose making use of the wide chemical resistance range of polypropylene to produce a hose suitable for the majority of chemical products at an economical price. Polypropylene lined fire~safe VRS composite hose with polypropylene coated steel inner wire and stainless steel outer wire. Short Description Polypropylene lined fire~safe VRS composite hose with polypropylene coated steel inner wire and stainless steel outer wire. Polypropylene lined fire~safe VRS composite hose with stainless steel inner wire and galvanised mild steel outer wire. Short Description Polypropylene lined fire~safe VRS composite hose with stainless steel inner wire and galvanised mild steel outer wire. ECTFE lined fire~safe VRS composite hose with galvanised mild steel inner and outer wire. Short Description ECTFE lined fire~safe VRS composite hose with galvanised mild steel inner and outer wire. Premium quality composite hose lined with ECTFE for its broad chemical resistance and high mechanical strength and low permeability. ECTFE lined high temperature fire~safe VRS composite hose with galvanised mild steel inner and outer wire. Short Description ECTFE lined high temperature fire~safe VRS composite hose with galvanised mild steel inner and outer wire. Premium quality composite hose suitable for high temperature use up to 160° C. Hose is lined with ECTFE for its broad chemical resistance and high mechanical strength and low permeability. ECTFE lined fire~safe VRS composite hose with stainless steel inner wire and galvanised mild steel outer wire. Short Description ECTFE lined fire~safe VRS composite hose with stainless steel inner wire and galvanised mild steel outer wire. ECTFE lined high temperature fire~safe VRS composite hose with stainless steel inner wire and galvanised mild steel outer wire. ECTFE lined fire~safe VRS composite hose with stainless steel inner and outer wire. Short Description ECTFE lined fire~safe VRS composite hose with stainless steel inner and outer wire. ECTFE lined high temperature fire~safe VRS composite hose with stainless steel inner and outer wire. Short Description ECTFE lined high temperature fire~safe VRS composite hose with stainless steel inner and outer wire. PTFE lined high temperature fire~safe VRS composite hose with galvanised mild steel inner and outer wire. Short Description PTFE lined high temperature fire~safe VRS composite hose with galvanised mild steel inner and outer wire. PTFE lined fire~safe VRS composite hose with galvanised mild steel inner and outer wire. Short Description PTFE lined fire~safe VRS composite hose with galvanised mild steel inner and outer wire. Premium quality composite hose lined with PTFE for its excellent chemical resistance. PTFE lined fire~safe VRS composite hose with stainless steel inner wire and galvanised mild steel outer wire. Short Description PTFE lined fire~safe VRS composite hose with stainless steel inner wire and galvanised mild steel outer wire. PTFE lined high temperature fire~safe VRS composite hose with stainless steel inner wire and galvanised mild steel outer wire. Short Description PTFE lined high temperature fire~safe VRS composite hose with stainless steel inner wire and galvanised mild steel outer wire. PTFE lined fire~safe VRS composite hose with stainless steel inner and outer wire. Short Description PTFE lined fire~safe VRS composite hose with stainless steel inner and outer wire. PTFE lined high temperature fire~safe VRS composite hose with stainless steel inner and outer wire.